I like to teach Exodus 25-31 by first starting out talking about why the Lord wanted them to have a tabernacle in the first place, and then liken this to our day to show why the Lord has us build temples today. Exodus 29:42-45 and D&C 97:15-17 are excellent verses explaining why the Lord had the ancients and his saints today build temples. 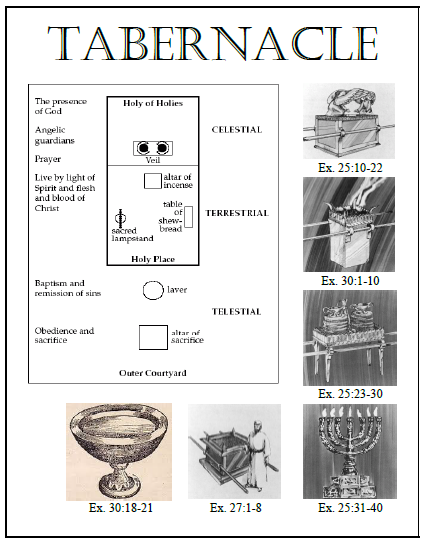 This entry was posted in Charts, Families, Jesus Christ, Old Testament, Symbolism and tagged Exodus 25-31, LDS, LDS seminary, LDS youth, Old Testament, temples, The Tabernacle. Bookmark the permalink.